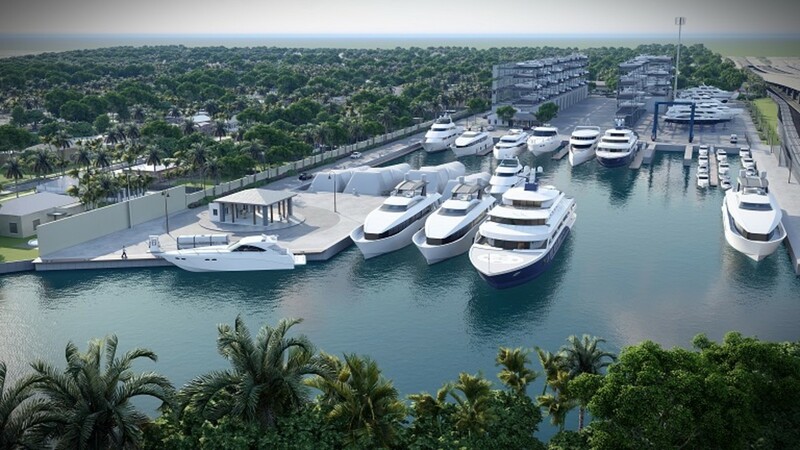 Port 32 Fort Lauderdale will include slips for large yachts and rack storage. Port 32 Fort Lauderdale, a new full-service marine facility on the former Fort Lauderdale Boatyard & Marina and Jackson Marine sites, is slated to open later this year. The new operation is on the north side of the New River across from Lauderdale Marine Center and Marina Mile Yachting Center. Port 32 Fort Lauderdale will have slips for yachts up to 150 feet and a self-service yard with a 150-ton marine lift. The property will have the only fuel dock on the New River near Marina Mile. The development plan will add commercial space for service contractors and vendors, as well as retail and office space. Storage units will also be available for lease. Port 32 Fort Lauderdale plans to become the largest drystack facility in Broward County. It will also have slips from 25 to 55 feet and such amenities as concierge services and a captain/crew lounge with Wi-Fi, laundry and shower facilities, and a grilling area. The Port 32 parent company is based in Charleston, S.C., and has locations in Palm Beach Gardens, Tierra Verde and Tampa in the Sunshine State. The group also manages Ripley Light Drystack, Shem Creek Marina and Ashley Marina, all in the Charleston area.